This website enables you to interpret the Marriage Index created by the General Register Office for England and Wales. By using it you can determine where your ancestors were married – not just which Registration District, but which church! 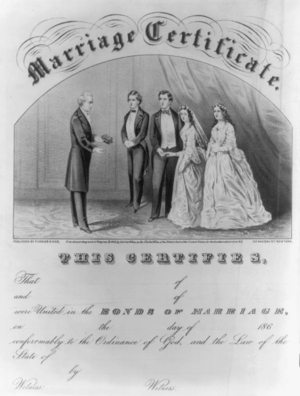 Family historians researching their ancestry in England and Wales can learn a lot from a marriage certificate, and the most common way to obtain one is to send for a GRO “copy certificate”, quoting the reference (year, quarter, volume number and page) from the GRO Marriage Index. This will cost you, currently, a minimum of £9.25 per certificate. However, if you know the Anglican church in which the marriage took place, and the church Marriage Register has been deposited (as most have been) in the local County Record Office, then you can go to the appropriate CRO and look at the actual Marriage Register that your ancestors signed. This is the purpose of this website: to deduce, from the year, quarter, volume number and page that you have acquired from the GRO indexes, where the marriage took place. This entry was posted in General from blog editor, Research web sites and tagged England, Genealogy, General Register Office for England and Wales, Guild of One Name Studies. Bookmark the permalink.